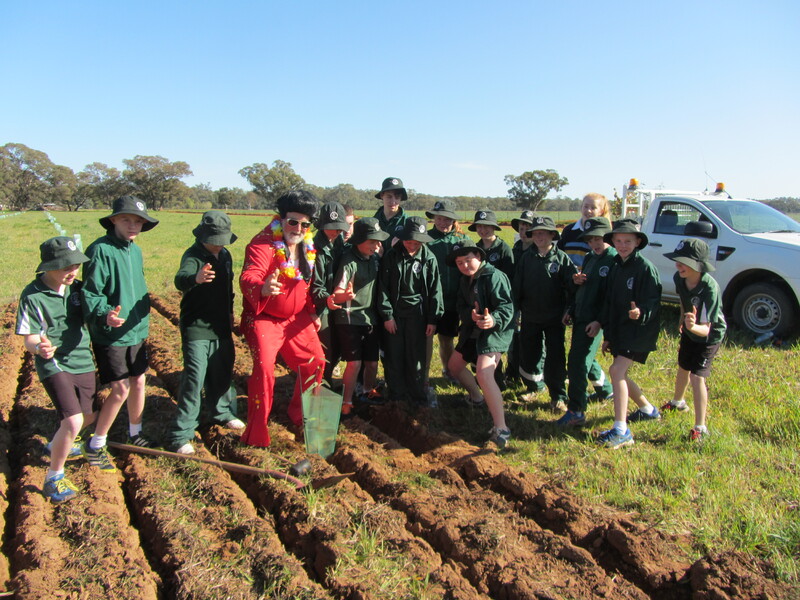 Landholders, have you heard about our Rebalancing our Landscapes (ROL) program? As part of Central West Lachlan Landcare’s (CWLL) commitment to improving soil health in our area, we are commencing the Rebalancing our Landscapes program that we will be outlaying over the next two years for members. This program will include free or discounted workshops on a range of soil health related activities and testing that we hope you will be able to use on your property and give us some feedback on whether you have made changes as a result of learning more information. We are keen to work with a group of our members that would like to be involved in a series of workshops and opportunities through the ROL program. To kick off the soil health related activities, CWLL have the opportunity to be involved in the Compost On The Farm workshop this month. We are encouraging members and the wider farming community to attend this workshop aimed at increasing soil health and, in turn, production. 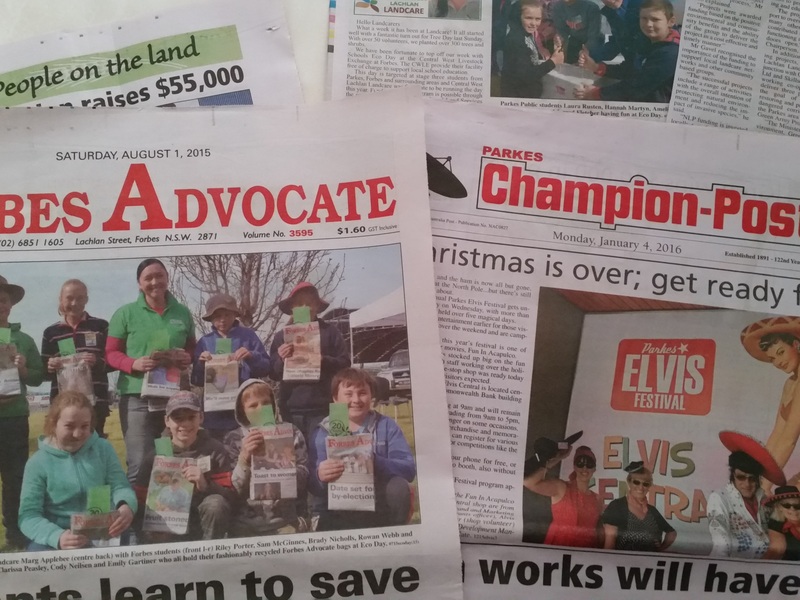 This initiative is possible through the Waste Less, Recycle More program funded by the NSW waste levy through the Environmental Protection Authority (EPA). We are offering attendees free or discounted microbial soil testing if they take up the discount compost offer that is being offered to participants – value-adding to the workshop! Gotta love it! ANL supply a trial sized amount to attendees for free and offer 25% discount to landholders who would like to apply a larger amount to their properties. We hope that by completing microbial soil testing, we can help you to better understand the benefits from a scientific point of view, not just by seeing increased production. If you are interested in building soil health and increasing production you are invited to join us at this workshop aimed at promoting the use of compost in grazing and cropping systems. Through this program you will learn more about using compost on your property and have the opportunity to talk with industry experts, compost producers, rural advisors and farmers who are already using compost. 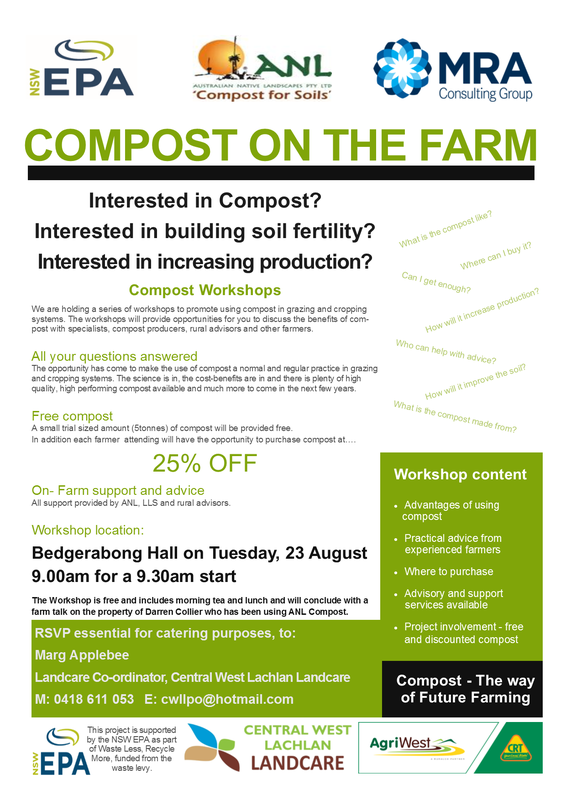 The workshop will be held at the Bedgerabong Showground on Tuesday, 23 August and includes free morning tea and lunch. Holding the workshop at Bedgerabong allows the opportunity to see some of the on-ground benefits of the compost at the property of Darren Collier and attendees can speak with him and consultants about application methods, ratios etc. Speakers will also include Roger Crisp from ANL, Virginia Brunton, Organics Consultant from MRA Consulting and Guy Webb from Agriwest. To book your spot at the Compost On The Farm Workshop or to be part of the CWLL Rebalancing Our Landscapes program contact me – details below. Click here for more information. Following on from this workshop, for members who join our ROL group, we will also be offering major discounts to attend the Stipa Conference on 4 November with guest speaker, Gabe Brown, who is a leading grazing and cover cropping farmer from the US. Want to learn more about Gabe? Click here to go to a TedX YouTube video to give you a taste of what Gabe is bringing to the Stipa conference.